An untitled oil painting by Hugh F. McKean (1908-1995). 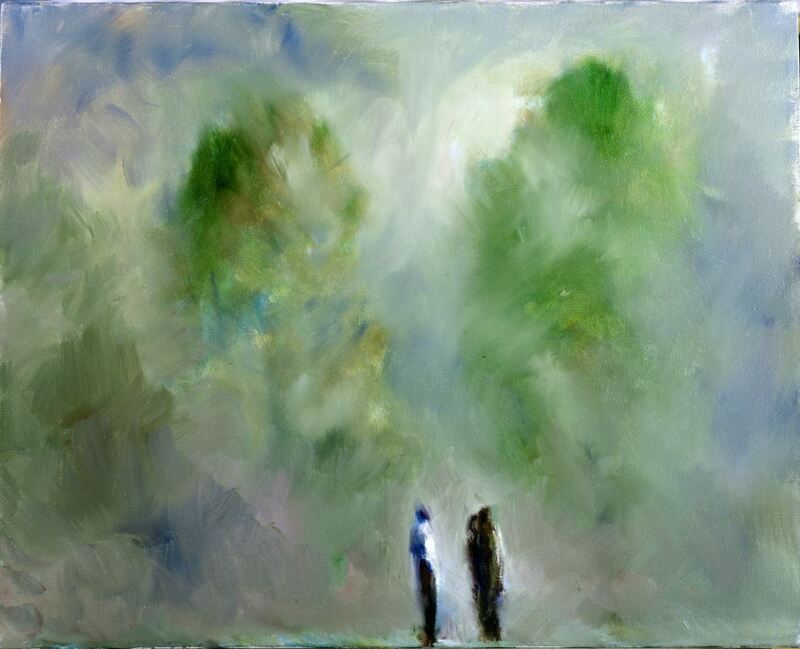 Although the painting has no official title, it is commonly referred to as Two Figures in Green Landscape. McKean moved to Orlando, Florida, from College Hill in Beaver Falls, Pennsylvania, where he was raised. He earned his bachelor’s degree from Rollins College in Winter Park in 1930 and joined its faculty in 1932, later heading its art department. He studied art at the Pennsylvania Academy of the Fine Arts in Philadelphia, Art Students League in New York City, the École des Beaux-Arts at Fontainebleau in France, and Harvard University. The Tiffany Foundation also selected him in 1930 to join other artists at Laurelton Hall, Louis Comfort Tiffany’s mansion at Cold Spring Harbor, Long Island, New York, under Tiffany’s tutelage. In 1940, he received his master’s degree from Williams College in Williamstown, Massachusetts. He married Jeannette Genius , the granddaughter of Charles Hosmer Morse, in 1945. McKean then served as the president of Rollins College from 1951 to 1969 and the director of the Charles Hosmer Morse Museum of American Art from 1942 until his death in 1995. Original 16 x 20 inch oil painting by Hugh F. McKean: Orange County Regional History Center, Orlando, Florida. Digital reproduction of original 6 x 20 inch oil painting by Hugh F. McKean. Orange County Regional History Center, Orlando, Florida. Originally created by Hugh F. McKean. Copyright to this resource is held by Hugh F. McKean and is provided here by RICHES of Central Florida for educational purposes only. "Hugh F. McKean." The Charles Hosmer Morse Museum of American Art . http://www.morsemuseum.org/morse-history/hugh-f-mckean. "Hugh F. McKean (1908 – 1995): Artist, Educator and Philanthropist." Olin Library, Rollins College. http://lib.rollins.edu/olin/oldsite/archives/golden/hmckean.htm. 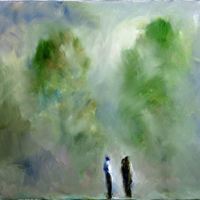 McKean, Hugh F.. “Two Figures in Green Landscape by Hugh F. McKean.” RICHES of Central Florida accessed April 21, 2019, https://richesmi.cah.ucf.edu/omeka/items/show/5512.